The Amish Small Lennox Swivel Bar Stool loves its clean lines and we think you will too! Contemporary solid wood style to line your kitchen bar or counter, the Lennox features a Benton scoop in the seat, wide curving back slats and rich legs that curve outward. 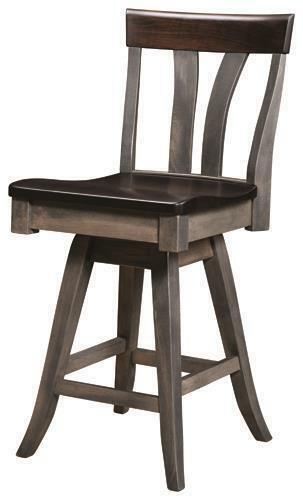 Enjoy casual dining with a lovely set of new bar stools that can be customized for your kitchen. Wood samples are available for you to inspect at home to find the perfect fit. If this is your first time ordering furniture online, we invite you to inspect our Reviews Page. We want you to feel comfortable with the process and confident that you will receive heirloom quality furniture. Please email or call a Furniture Specialist with any questions.